I have been doing a bunch of searching on Craigslist lately for my latest design project – not a kids room this time, but a living/dining room space for a young professional (more on that to come!). One thing my client needed in the space was some extra storage and a place to put her TV. 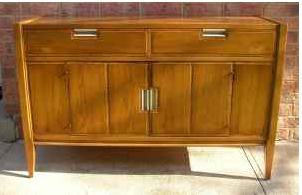 Thanks to Craigslist, I found an awesome solution, and it’s one I bet would work well in almost any space – a mid-century credenza! 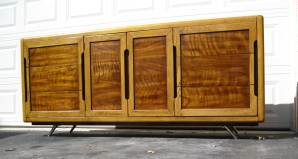 For $300 you are getting a solid piece of furniture (real wood!! 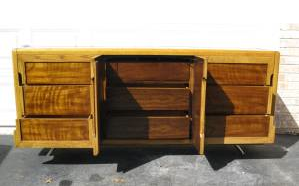 ), a ton of storage, and a versatile piece you could put in multiple areas of the house – it could hold your flat screen in the living room, be used as a buffet / sideboard in the dining room, a dresser in the bedroom, etc. 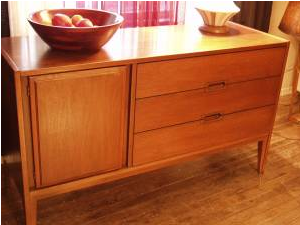 I think the trick with mid-century pieces is that you have to use them in small doses – like one piece per room – to avoid making it look like you live in the 60s. 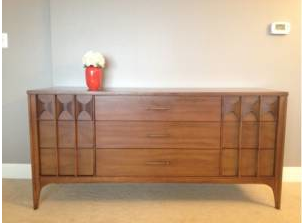 However, it could look so cool mixed in to a room for an eclectic look. What do you think?